The conclusion of our three-part Q & A with Dr. Scott Ashmon, editor of The Idea and Practice of a Christian University, follows below. You can read part 1 here and part 2 here. What prompted you and your colleagues to develop and write this book? This book responds to the need for a full-bodied Lutheran vision of Christian higher education. Many Christian universities, including Lutheran ones, are wrestling with the challenge of maintaining and advancing their church-related identity and mission under the increasing pressure to loosen or abandon their theological moorings to stay afloat financially or rise up in the rankings. There are several exemplary books that address this challenge and recommend ways to invigorate theological faithfulness and academic excellence. However, none of them plumb the riches of Lutheran theology and apply them to the whole scope of the modern Christian university. This book seeks to fill that void in a biblically sound, distinctly Lutheran, thoughtfully applied, and winsomely engaging way. Which chapter in The Idea and Practice of a Christian University most surprised you and why? The chapter on “Luther on Trade and Commerce” by Christopher “Kit” Nagel was the most surprising. It is unusual for Martin Luther to be put into conversation with modern economists, economic models, and economic debacles. Nagel does this wonderfully in bringing Luther’s theologically-based economic view of Nächstenliebe (loosely translated as “love and care for those around us”) into dialogue with Adam Smith’s theory of “self-interest” and the “invisible hand” of the free market. Luther held that commercial life should be approached in the way that we approach the neighbor, which is in light of the cross: “I will give myself as a sort of Christ to my neighbor as Christ has given himself to me.” Nagel’s chapter also brings Luther to bear on pricing, monopolies, usury, finance, the 2008 financial meltdown, and business education. The chapter illustrates the interaction of faith and learning by showing how Luther addressed economics, and how Luther’s theology can still be applied to economic theories and issues today both in and out of the classroom. Is The Idea and Practice of a Christian University for the faculty and leadership of higher educational institutions, for the students, or more broadly for the constituency of the institution? How might these different groups make use of the essays in this collection? The book is principally written for faculty, administrators, staff, and boards at Christian universities. We hope that the book provides a biblically-based, thought-provoking approach to the nature and practice of a Christian university from academics to athletics, residential life to campus ministry, administration to teaching. Questions at the end of each chapter aid the reader’s reflection and action. The book can profitably be read by individuals, but is best read with colleagues from all parts of the university. Communal dialogue will enliven, illumine, and strengthen a shared, holistic vision of the purpose and practice of a Christian university. 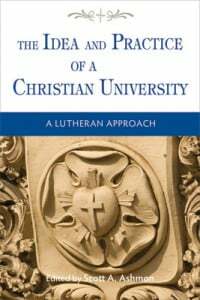 The book is also useful for pastors and parents interested in what Lutheran universities were, are, could, and should be. We hope that it partly addresses the question of the unique value and benefit that a robust Lutheran university education offers every student in any major.